This photo was taken during the 1927-28 school year. Elsie Carlson (young woman in the back on the left) graduated in 1928. It’s obvious that Eatonville has been turning out smart students for decades. 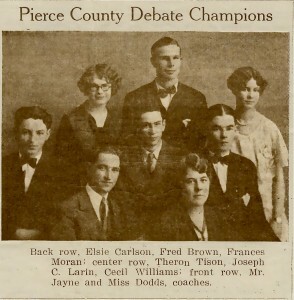 Elsie Carlson, back row, left graduated from Eatonville High School in 1928 so the picture was probably taken during the years 1927-1928. Thank you so much. I’ll make the change to the post right now. Elsie Carlson was also co-valedictorian in her graduation year.